Last Updated: April 17, 2019 · Published: January 10, 2017 By: Asian Caucasian Leave a Comment This post may contain affiliate links or sponsored content. I would never ditch that leftover turkey carcass from the holidays! No way! Drop it in a pot with carrots, onions, herbs, and spices, and voila — homemade turkey stock! 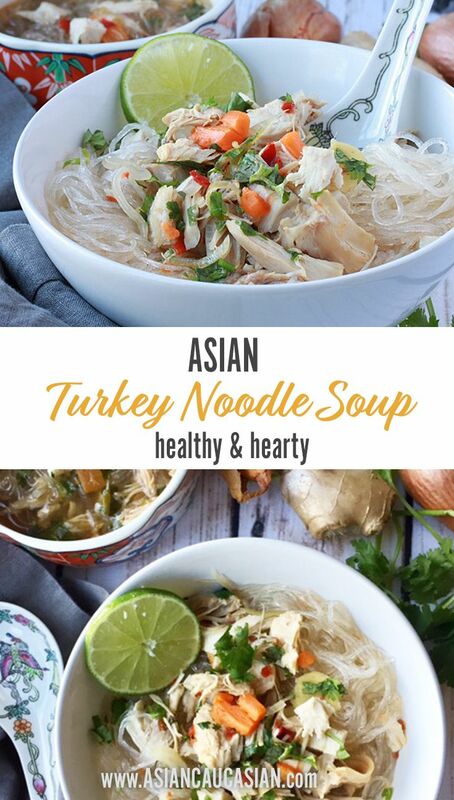 I used the stock for this delicious Asian-inspired turkey soup. Loaded with deliciousness, this bowl of yum is also healthy and filling. 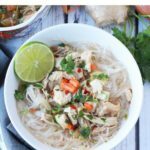 The ginger, shallots, lime, and touch of heat from the red chili paste (sambal oelek) combined with the turkey and bean thread noodles is one bowl of noodle soup that you’ll savor all week long! Slurp away! 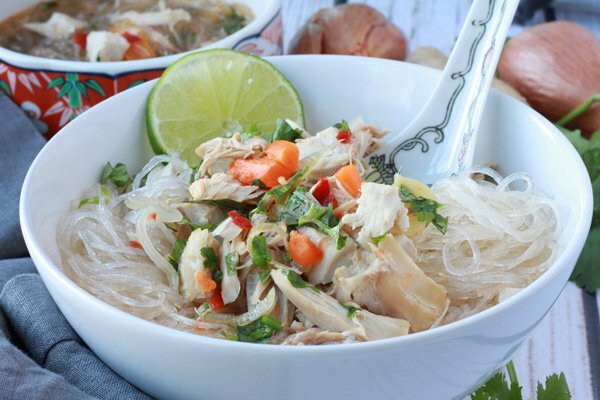 Bean thread noodles soak up this delicious bowl of turkey soup! Place the turkey stock in a large stock pot, bring to a boil and lower heat to medium. Add in the garlic, carrots, shallots, ginger, and kafir lime leaves. Cover partially and simmer for 5 minutes until vegetables are tender. Add in the sambal oelek, fish sauce, and lime juice. Cook another 5 minutes until fragrant. Check for seasoning. Meanwhile, pour boiling water over the bean thread noodles in a large bowl and let sit until soft, about 5 minutes. Drain the noodles and set aside. Add the turkey meat and cilantro to the soup mixture when ready to serve. Stir for 2 minutes until heated through. Serve the soup by first placing the noodles at the bottom of the bowl, and ladling the soup on top of the noodles. Garnish with cilantro and lime wedges. Sambal oelek can be found at select grocery stores and at Asian markets. Kafir lime leaves are available at most Asian markets and select grocery stores. The dried version can be found at select grocery stores like Whole Foods. You can substitute the kafir lime leaves for bay leaves.